Experience the magic of panoramic ocean and sunset views from your architect designed three-bedroom, two bath beachfront home. One of four beachfront homes ideal for family reunions or small weddings. Dramatic, open, upstairs master suite (Q) with full bath and sitting room (2T) offers stunning ocean views in three directions. Ground level has two bedrooms (1Q with a window A/C, 2T), full bath, fully equipped open kitchen, dining area and living room opening onto a large covered lanai. This home includes an outside Hot/Cold enclosed shower, free WI-FI Internet access, cable sports channels and HI-Def Flat Screen TV. Take stairs down to the small sandy beach with reef and tide pools to explore; walk east 100 yards to the right and find a swimming area and keyhole opening to the ocean; continue walking east another 100 yards to the west end of beautiful Kawela Bay. Conveniently located. A short drive to the east; Kawela Bay, Turtle Bay Resort (golf, restaurants, eco tours, swimming), Kahuku Town (9 hole beachfront public golf course, Food Trucks), Malaekahana Bay (swimming, shoreline walk, surfing), Polynesian Cultural Center and to the west;Velzyland, Ted’s Bakery, Sunset-Pipeline (surfing), Shark's Cove & 3 Tables (snorkeling, Food Trucks), Waimea Bay (swim, dive rock, giant surf), Waimea Valley FallsCultural Park and historic Haleiwa Town. Beautiful location. Gives a true North Shore vacation. No crowds and the hustle and bustle of Honolulu. Our families loved it, a short walk to Kawela Bay and fishing from the beach right in front. We watched the whales everday and actually enjoyed all the chickens running around. From the locals to the management staff everyone truly displayed the Aloha spirit. Comfortable, roomy for all 8 of us, little outdated but had everything you'd need. Right on a mixed beach/reef, best of both worlds. Comfortable beds, going to sleep with awesome waves sounds. House is outdated but has great character. Had all the needed kitchen items and more (coffee grinder!). Great back yard for little ones. Would definitely rent again. We loved this little beachfront bungalow!! It was clean when we arrived, and we were in love with the sound of the waves crashing and the beach right outside our door. The Team was very kind and allowed us a late check-out to accommodate our late flight. The house is a bit dated and could use some additional cups/cookware in the kitchen, but the location made up for this. We had an amazing stay - the place is incredible. Everyone was super helpful. We had a accident with the tv and the team was very understanding. We would highly recommend this place to all of our friends. We really enjoyed our time at this beach house. We planned a family staycation here. Being a resident of Oahu... staying here gives you a whole new appreciation of "living in Hawaii." The property was accurately described. The house was spacious and fully stocked with all the necessities to cook. We enjoyed the beautiful view and very close proximity to the beach. The sand was beautiful! We had a wonderful time in Hawaii. The views from the rental were absolutely stunning. The private beach access and outdoor shower was a huge bonus! We spent every morning on the lanai drinking coffee and enjoying the view. The home was a bit aged which is to be expected being next to the ocean. We did see contractors at the neighboring units completing some repairs which indicated that the management company takes care of the units. There was plenty of space for our family and the bedroom configuration worked out perfectly. The grounds were well taken care of and we enjoyed watching the free roaming chickens which added to the island vibe. Absolutely LOVED it! Friends, family and us will rent in the future! We stayed at Kawela Kai Nani 493 for 3 nights and enjoyed every moment. We spent most of the day outside on the large patio/deck. The weather was great, the beach rocky (but we're used to that), the house was huge (not too hot), the beds were comfortable, and the kitchen full of all cookware/utensils that you need. My family enjoyed our stay here at this vacation home. Watching the sunset from this comfortable lanai and having your own foot prints in the sand be the first in the morning light is like Heaven. The house was in a great location and right on the water. The property is a bit dated and wasn't the cleanest when we arrived. Only one bedroom has AC and the house gets very hot during the day and evening. I would not have been able to sleep comfortably in the areas without AC. The good thing is we spent almost all our time on the back porch. I would give this property 5 stars if it had AC. I would recommend this property. Fantastic views and beautiful secluded beach. Loved the roosters and chickens in the yard. House was clean but a little warm with air conditioning in only one room. Outdoor furniture was worn out with some tears in the seats, but overall we loved our stay. Shark's Cove and Turtle Bay were fun snorkeling spots near by. Great property management team. We really enjoyed the view of the ocean and tide pools on the beach. First day, we saw whales breaching and fluking out on the water. It feels like you have your own private beach. 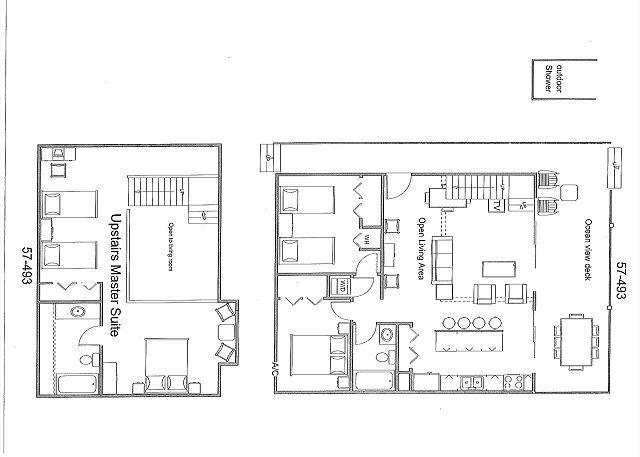 The home is dated in some ways but the layout was perfect for our needs. Really enjoyed the large patio. We had most of our meals outside. It rained a bunch and the mosquitoes were out at night. This was the perfect house for our family. It was clean and just the right layout. We could take hikes to the banyan tree, Turtle bay and the Kawela Bay(SP?) It was right on the beach with sand and tide pools. Loved it. Wonderful stay. Would highly recommend. This house is beautifully situated--the beach is walkable and almost always empty, but not swimmable in winter. Sunsets are remarkable. We ate every meal outside and surfers and non surfers alike loved the outdoor shower. Plenty of room to sleep our party of five. Great location for a quiet week with the family. We rented this for the sleeping configuration for our group. Coffee on the deck each morning was surreal and relaxing. Home needs some basic maintenance (screens torn, toilets loose, faucets leak, etc.) but everything worked. Nothing fancy and the kitchen cookware is very limited with no baking pans. Overall nice stay with family. This is a low end cost rental that worked well for our needs. The view and the grounds and the beach will not disappoint. It's quite rocky in front but still plenty of beach to lounge on and the rocks are a great deterrent for little ones wondering in the water unsupervised. There are small areas to go swimming in but the current can be vicious so not super safe for weak swimmers. The house is comfy and has all the amenities but could use a bit of an update and some love. Since it is a bit dated, the tubs are old and the grout in the kitchen impossible to get sparkly clean so the house looks a bit dirty. Since the property is for sale, am thinking it doesn't pay to put a lot of money into it. Sophia and her team are amazing at getting back to you right away and no trouble finding their office for key pick up or locating the house. We had some plumbing issues(slow drains in sinks and tub) which were fixed right away. Also no frying pan when we arrived and it was delivered as soon as I asked for it. Great service! Best thing about the house is the location. 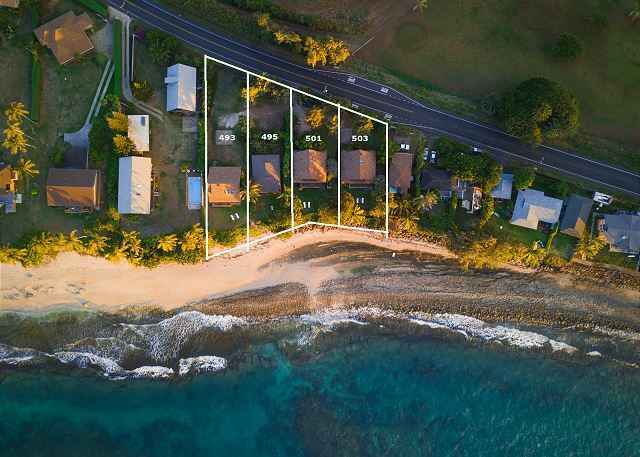 Very close to Turtle Bay resort (great swimming/snorkel beach and restaurants/golf), Foodland is super close, Sunset Beach, Waimea beach, all 10 min drive. And the sunsets from the deck are gorgeous. I am not sure if I would rent this again, the location makes it worth while but may look for something less dated next time. Excellent location. Right on the water. Home was perfect and fully equipped. We recently stayed a week in Oahu and what a wonderful week it was. The house was perfect. Situated right on the beach, trade winds blowing and sunsets off the back deck. Our girls loved the chickens in the yard, the cat that visited in the mornings and the geckos at night. Our family of 7 enjoyed the quick walk down to the beach, where during high tide a natural pool would form. Using the keyhole to the reef for snorkeling, finding sea stars and sea cucumbers in the reef are memories that we will cherish. 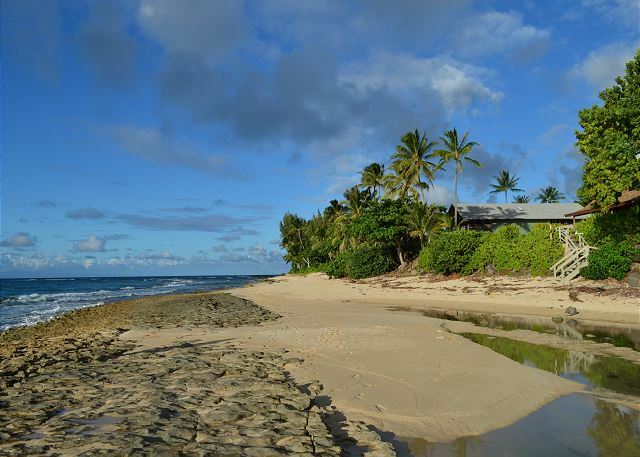 We would recommend Kawela Kai to everyone for their North Shore stay. Our stay was so relaxing! Love the deck and amount of space upstairs. The house was clean and had screens on all windows and doors facing the ocean so we could enjoy the breeze without all the flies coming in. Great neighbors too. We were told that there was a leak at the upstairs sink and a plumber would be stopping by. I didn't see a leak, he came and also noticed the toilet running and tried to fix it. Mostly loved it. Couple of negative things stand out.... ran out of hot water after 5 minutes into showering... (consistent day after day.) Didn't appreciate random dogs coming onto property, whether from neighbours or up from beach. Grout on kitchen island was really gross. House was extremely hot upon arrival and didn't cool off until next day. Got most of our mosquito bites here. Didn't anticipate that as last time I was in Hawaii I didn't get bit. 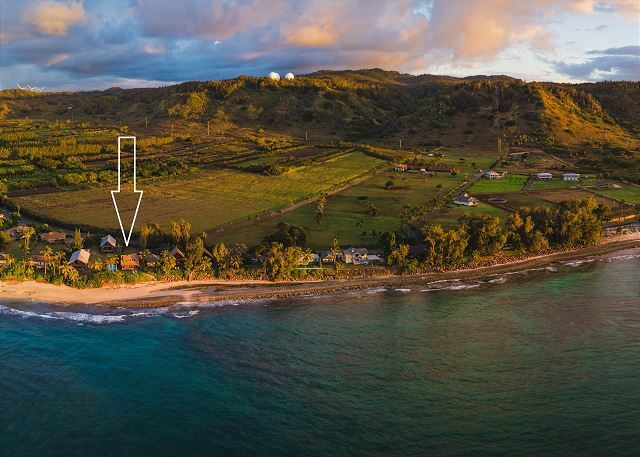 Positive things that stand out: awesome location between Haleiwa and Laie (chose it specifically for this,) Loved the reef and sandy beach (chose a reefy spot to keep my wandering kids from going into the ocean,) the views are so very, very lovely. Architecture-wise, it's a unique and beautiful property. Kids enjoyed the local chickens + chicks, geckos and resident cat (that we still don't know where she lives.) There were many fans and when the wind wasn't blowing there were very necessary. The owner was very nice and helpful throughout our stay. Her welcome note was such a kind gesture upon arrival--totally won me over. We'd stay here again. Our vacation rental house was everything it was advertised to be. Right on the water, great back yard, great ocean access, great location. Great location, house could be in better condition. Overall I had a great experience. The house is located at a wonderful place and waking up to the ocean and waves was great. The management company was very friendly and professional. The only complaint is that some things were kind of old and a little dirty. The house and location was perfect for our family. We traveled with our three children aged 18, 5 and 4 and the house was perfect. We hope to one day return and would definitely hope to be able to rent this beautiful home again. a guest from Honolulu, HI does not recommend this vacation rental. We booked all four Kawela Kai Nani cottages for 5 days, 4 nights for a family vacation and our wedding November 2016. - The lot and landscaping were beautifull! - The space was perfect for a large party our size. - The seclusion and near private beach was great. - The view right on the ocean was amazing! - The venue was perfect for our wedding. - It was not easy to get detailed information from the rental Manager Sophia. - I had to ask for the same information multiple times and follow up to get an answer. NOT that awesome when you're spending over 10k for something. - There was a major power outage during our stay (which we understand is out of the control of the rental company.) But we were without power for 9 hours, with no call or check in from the rental company. Also, the tiki torches on site would have really helped us have light, but all but one were broken. So overall the place was wonderful, location and houses were great! Customer service was not good... and definitely left a bad taste in our mouths. Which is very unfortunate because you folks have a great product that really sells itself. I would recommend this place but only with a different rental manager. I had my wedding here and it was so perfect. My family stayed in all the houses. It was just enough space for everyone to be close but have their own house. The views and beach area are so special. I feel so lucky to have had my wedding here. My family and I rented this house for my wedding last month. We stayed there for a week before and we loved it. This house is in an amazing location, and the views are ridiculous. It was still close enough to local markets that we did not have to drive forever to get supplies. We will definitely come back here! Our family had such a great time at Kawela Kai. This is the spot where I was married and my wedding in 2012 was just as great. The homes are in a great location, perfect for children and centralized to many activities nearby. Kawela Bay is the perfect place for kids to swim. I would highly recommend this home to anyone just looking to getaway, have a stay cation or to have the perfect wedding with the perfect backdrop. This home has plenty of space and beds for our whole family. Wonderful ocean with great views from all of the windows. Soothing wave sounds. Convenient hose and shower to rinse off after beach visit. Lots of room to park. My kids enjoyed each having their own bed. Especially the one in the room with ac. The home doesn't lend itself to easy air conditioning, but adding one plus fixing the upstairs fan would help out. Sophie and Team Real Estate are easy to work with and very kind and helpful. Had a wonderful experience staying here. Beautiful ocean views and just steps to the beach. Great location on the North Shore. Can't wait to stay here again. A++ experience. Relaxing week on the beach. No frills vacation home but had everything we needed for a great vacation away from the city. We had a great time and enjoyed our stay. The house was nice and clean when we arrived, sleeping arrangements were perfect for our family. There's only one room that has a window AC unit, the home would get a little warm in the afternoons but with the windows and doors open there was always a nice breeze from the ocean. I would recommend this vacation home for a nice relaxing time, it's away from all the hustle of the big cities. We had a rough start due to some miscommunication and a lack of signage. We absolutely loved the layout of the house and the location. It is everything it is portrayed to be in the pictures. However, we had way too many encounters with geckos inside the house! WOW, everything was absolutely amazing! Was a perfect location for all of our activities and housed our whole family very well. Very comfortable and had all the comforts of home. Price was great and couldn't beat the sunsets and swimming/snorkeling. We have two young boys and having our own space (not being in a hotel room) was amazing and breakfast on the lanai was wonderful every day. Would stay here again! The home is essentially what the words "vacation rental" conjure. Just the essentials, but in an absolutely lovely location right on the ocean. The beach is mostly unusable due to a lot of jagged rock along the shoreline, but the view is amazing (especially if your sightline avoids said rock, which resembles eroded concrete). No central AC (there is a window unit in one of the first-floor bedrooms) but opening the windows at night provides more-than-adequate cooling. Laundry facilities are kind of laughable, just a stacked "compact" W/D combo. Basically, nothing special here from a lifestyle standpoint -- just a serviceable place to call home base, with plenty of windows and a fantastic view. We'd stay there again. Overall our stay was a great experience. The kitchen cookware could use some upgrades and carpet cleaning. Could not beat the views and would rent this unit again. The property was as described and in a quiet location with amazing views from the living area & loft bedrooms. Plenty of room for the whole family (we had six) and a short drive along the highway to the north shore surf breaks and restaurants etc. Natasha replied to our enquiries promptly and was very helpful. On arrival there was a little gift and hand written card from the owners which was a nice touch. This is a wonderful spot. Quiet, beautiful surroundings, away from town, but close enough to enjoy anything you want on the island. Very relaxing!! The views are amazing and beautiful. There was 8 of us(all 20 and older) and the accommodations worked well. The house was clean but could use a few updates/repairs but overall not a big deal. The view was amazing you won't be disappointed. Supplies were limited so you will need to purchase the necessities. We were there over the Christmas/New Years holiday so response time wasn't immediate but they did eventually get back to us and the repairs were made. Would we rent this house again...you bet! Thanks for entrusting your home to our family. I'm so glad we picked this house. Despite the house being older and needing a few fixes (new blinds for the windows, lighting, screen doors) it is a great location and a great size. It is open, comfortable, the lanai area with the wrap around seating is amazing and the best part, the view is perfect. The beach area was the most perfect spot for my wedding. The backyard area was also a perfect spot for my reception. This house is definitely a place I would like to come back to time and time again. My husband and I rented out all four houses for our beautiful wedding. Our family who stayed in the venue enjoyed this beautiful home. The property was well maintained and clean. The only thing that I was concerned with, but was lucky enough that there was huge swell (surf) that came in the week before of my wedding that swept out the branches and wood that were trimmed from one of the trees on the property. In addition, my family love to go fishing and enjoyed fishing late at night. Great spot. The house needs some attention as carpets are older and the electrical outlet in the upstairs bath is loose on the wall. Our car was ransacked one night. We had a few loose coins to insure they felt successful. Beats replacing broken car windows. It would be an excellent idea to fix/replace the broken fense board. Also, you may wish to consider putting up a gate and additional wooden fencing. It is helpful to protect small children near a very busy highway. Equally important, it would discourage petty theft and easy access to the property. A wooden gate with a rubber wheel rollers on a concrete paver base would be most cost effective. It can be built as is the current fense. Our family would feel much more comfortable and I assuem the other guests and houses which you own would benefit as well. We very much enjoyed our stay and will plan to return in the future. Please seriously think about the gate and fence! When I rented this house online I did not realize it was right on the water.You can only imagine my delight upon seeing the location. This is a great house for a family. The yard is wonderful and a good place for small children to play. It is not isolated, but you definitely have privacy from your neighbors. The outdoor shower is wonderful. I only took 1 shower in the house all the rest were outside. I would definitely recommend this to friends and family. Kathy at Team Real Estate was very patient with me during the booking process. This property lives up to its description! This property is absolutely lovely. Well situated for getting around by car and far enough away from town to feel quiet and private. There were five of us in our party and we included quiet readers and avid surfers. There was plenty of room in the house and the surrounding area for us to pursue our interests and come back together every evening for dinner on the lovely porch. The property was clean. The property management company was very responsive from answering my first e-mail inquiry, through setting up the contract and during our actual stay.We had a great vacation! Great place to relax and spend quality time with family, yourself, and nature. The house and location are perfect, the sunsets are exceptional. The location is amazing - we have stayed on the North Shore numerous times and this was by far the best suited for us. House and its configuration was also perfect. There were broken lawn furniture we couldn't use, and the furniture/appliances are definitely on the tail end of their life cycle. The bathroom fixtures needed some TLC to make them seem spotless. Good assortment of vacation home amenities otherwise. And seriously - the location is unbeatable. Wish I was still there! Tim K from Apple Valley, CA does not recommend this vacation rental. Location, location, location. This property offers an absolutely A+ location. 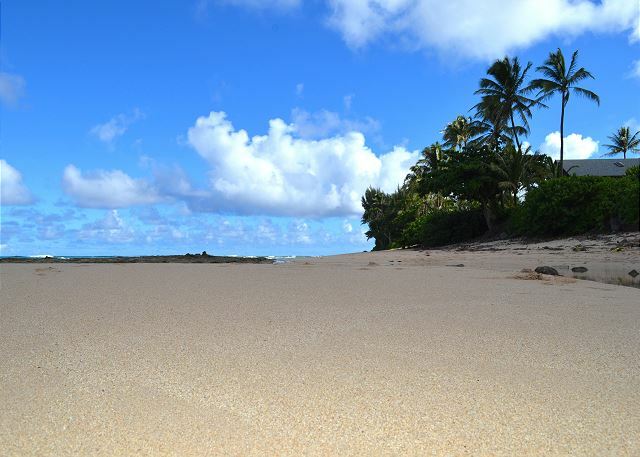 The beach it sits on is stunning, the natural North Shore beats crowded Honolulu every time, and there is easy access to groceries, a resort (Turtle Bay), and the best beaches on the island. With that all said, the house itself is not great. No a/c and little air movement makes the house pretty dang warm inside. Kitchen is hardly stocked, and even some of what it does have is very worn down. If you just care about location, go for it. If you want a house to spend time in and relax, this may not be it. We loved the North Shore and this house was just perfect for our family. Very comfortable house but our favorite was the view of the ocean from every window on the west side. The sunsets were beautiful! Once we discovered how good the outdoor shower was we all just showered outside with a view of the ocean! Great vacation house. Will stay here again if (hopefully when) we return to Oahu. I've been to Oahu over a dozen times and have always stayed in Honolulu/Waikiki. This time we wanted to stay on the North Shore for the beautiful beaches, peace and gorgeous sunsets. And that's what we got! The property & location of the home was a more than we expected. If you are looking for an expensive 5 star hotel with amenities and pool then this is not for you. This is an old hawaiian home with some sightings of lizards,gecko's & bugs There was no a/c but in one bdrm. But the breeze comes in all day & night. There are fans. It was a 2-story ocean front home that sleeps 8 ppl, 2 baths, 2 showers, TV, outdoor showers, full kitchen, BBQ and the most beauitull view of the ocean you could imagine. The living room furniture was a little worn but everything else made up for it. And definitely, much more affordable than any hotel in waikiki. No $35 a day resort fee or $40 a day parking fee like the hotels. We loved the town of Haleiwa, Ted's bakery, Haleiwa Cafe, Cholo's, & local food market. We had fresh Ahi every day. The north shore beaches are gorgeous. Waimea, Sunset, Turtle Bay. I would definitely stay again at this home and the North Shore. The waves are calmer on the North Shore in the summer. The Fall & Winter the N.Shore can have huge waves. No problems checking in or out either. The beach House was secluded, private, quiet. Good fishing and swimming. And you have your very own entrance to the beach a plus. Also if you decide you just want to tan in front of the house they have lounge chairs and a table, very nice. This home was a great place to stay with family as we attended our son's wedding on the north shore. It was comfortable and waking up every morning to the sound of waves and having coffee on the lani was the perfer way to reduce the stress of wedding prep. 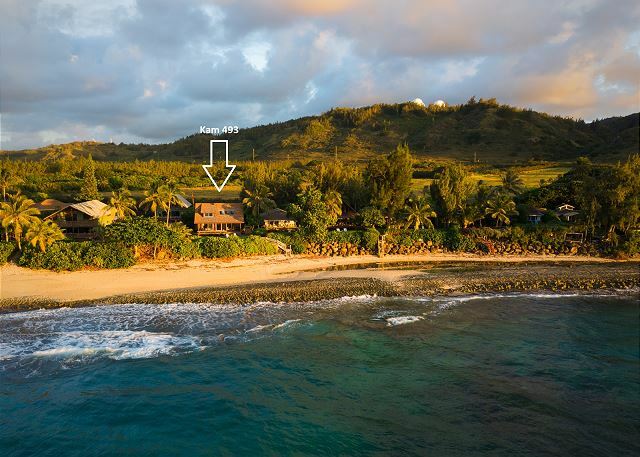 I've been to Northshore Oahu several times, and this house is truly the best location I've stayed. Its quiet, clean, spacious and did i mention ABSOLUTELY STUNNING. Our family had a wonderful week stay at Kawela Kai. The location is amazing, glorious sandy beaches nearby, fantastic snorkelling a short drive away at Pupukea and incredible sunsets almost every evening. The house was clean and comfortable. There are lots of geckos to keep the bugs away and keep us entertained. We had a few minor issues during our stay but the property management company assisted us promptly. I would recommend this rental for families who would like a quiet, relaxing vacation. home was clean enough but you not too nice that you have to watch every move you make. Good kitchen area to have friends over and BBQ, I wist I were there again. Just the get away my family needed. Beautiful house photos provided are accurate. Loved listening to the waves at night and nothing beats that ocean breeze. Main landers will find the kitchen and bathrooms a little outdated but the house and surroundings are breathtaking. We love the North Shore of Oahu and stay there every time we vaction in Hawaii. Kam 493 and Hale Nani are beautiful homes in private locations which provide a blissful, restful and memorable time in paradise. Team Real Estate is tops in ensuring a responsive customer service experience. It was very niece and we enjoyed our stay. It was much quieter than down at the surfing beaches. I would ask the owners to see if they can replace the rugs as although cleans were heavily warn. And, the broken tiles in the kitchen made the place seem a little run down and the tub calking should be redone(they were clean but had the appearance of looking like mold). Lastly, we had a few to many run ins with cockroaches which seem to be prevalent all along the North shore. But, all things considered it was a very wonderful stay. Our vacation stay was wonderful. The house had everything we needed. The iPod dock was nice to have. The only thing I would recommend would be a few more mirrors. We had 7 women in our group so the bathrooms were a little crowded. Thank your team real estate. We stayed in this beautiful Kawela Kai house and really loved the relaxed and privet atmosphere. The house is nicely appointed and has a beautiful view of the ocean and has a lot of greenery around. It feels secluded and very relaxing. The most famous surfing spots - Sunset Beach, Pipe Line, Log cabin are just a few min drive away. Food Land is close also. There is a very nice fruit stand almost next to the house on Kamehameha highway - the papayas are from another world.The drive to Haleiwa can be around 30 min if there is a traffic. In general it is a great home for people who loves to be away from the crowds to enjoy the beauty of nature and the majesty of the ocean. Wonderful location and views. Attention to details needed. We arrived late and had to pick up the keys after hours and the information sent to me was perfect! We met some wonderful people in our area. The weather was spectacular as well as seeing the turtles so close to shore. We did a family reunion there and all of our family would like to make this an annual event!! The house is very quiet, has a beautiful view of the ocean and a nice and clean interior. The only downside is that there is no swimming right in front of the house (walking distance to nearest beach 10min) , but because of that you won't see a lot of people near the house, which is awesome too! Breathless! That s the best word to describe our experience. The house was great and very clean. The beach just a few meters from the house and the ocean view was great. Would definitely recommend this to a friend! We loved this rental home and would stay there again if we ever visited the island. We loved sitting on the deck each morning and evening to eat our meals and watch the whales spouting water. So relaxing and such a beautiful view! The planned replacement of all the windows and sliding doors will be the perfect improvement to this property. We loved the location....sooo much more peaceful than the Honolulu area! We loved this house! Beautiful views, very central in the north shore and great tide pools right in the front of the home. Loved the outdoor shower as well. Such a relaxing and fun experience for the whole family! We loved our stay in Hawaii! We will probably never go back to renting a hotel room, we're converted to beach houses! Our rental was in a perfect location. Close enough to beaches and grocery stores but secluded enough for peace and relaxation. The view was breathtaking! The only suggestions we had were to get air conditioning for the whole house, update the furniture in the living room, and definitely get a garbage disposal for the sink. Thank you for everything we loved our stay on the North Shore! This particular property has a view that cannot be topped. The entire front of the house is glass and looks right out onto the ocean. We were actually able to sit on the couch and watch whales spouting and jumping out of the water. Amazing!! Didn't even have to pay for a boat to take us out! The stairs beside the lawn lead out onto a beach that goes for a long ways either way you choose to walk. We absolutely loved our early morning and evening strolls on the beach. The only thing missing was a crow bar. I practically needed to be pried away from this little piece of paradise on earth. LOVED IT!! We had a lovely time on the north shore of Oahu. I was a little nervous about being in the hussle and bussle of all the activity. BUT our place was in the perfect location just out of all the traffic but close enough to town when we needed to get there. We had 3 families next to each other renting 3 places and it make for the ultimate experience flowing back and forth especially for the kids. and the beach out front was very private and scenic and lovely for short walks. thanks again !